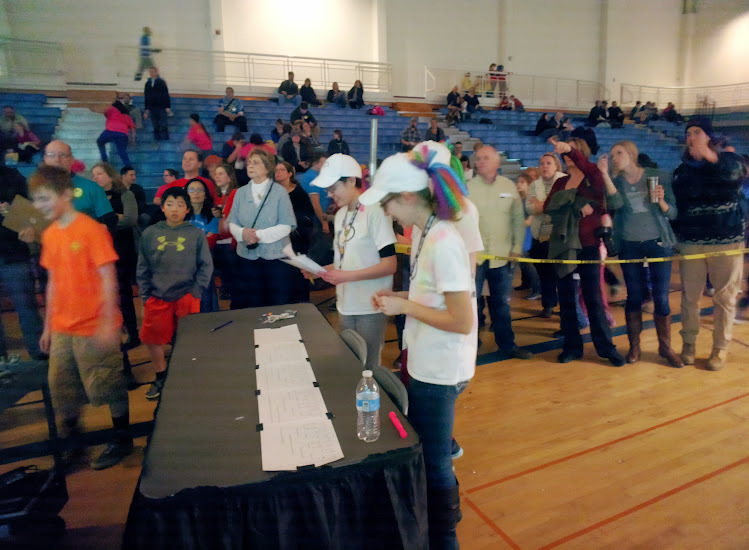 We’ve never had the chance to volunteer at the Lego League state tournament because we’ve always been competing instead. State is almost five times bigger with a excitement level to match. Although competing with 70+ teams from across the state is insanely fun, volunteering there is close to the same experience (but without the pressure and stress!). At this tournament, when signing up, we had been assigned the check-in table for the performance area. This meant that we would meet and talk to every team competing there. Working at the check-in table was something we had never done before, so we were excited to try it out. By signing up to be a referee, our coach was doomed to be a part of the annual referee dance. However, we had no idea that we’d be looped in with him. We ended up borrowing striped shirts and dancing alongside the other “super enthusiastic” referees (except Rose, who bailed with the excuse “I’m going to film it!”). Once the opening ceremony festivities were finished, we got straight to work at the check-in table. As the day went on, we came across many teams that we knew from previous years. It was a lot of fun to say hi to them again (since we no longer get the chance to compete with them at tournaments). It took a solid hour before the officials were able to break up the celebration to begin the actual ceremony. To our delight, Remember the Tigers (an FLL team we’ve known and competed with for years) won 1st place at the tournament. This earned them a spot to compete among the best FLL teams in the world at the St. Louis FIRST World Festival. We couldn’t have been more excited. Since we began in FLL, we’d dreamed of when we would be able to volunteer at the Minnesta state championship. With a hilarious referee dance, a massive party, and a team we know making it to the World Festival, it was everything we’d hoped for and we can’t wait to volunteer again next year.